Senior Center Activities | Friends of the Longmont Senior Center, Inc.
Get Acquainted with others and at the Senior Center. Ask about the every other month gathering. Bridge, billiards, quilting, mahjongg, shuffleboard, knitting and table tennis to name a very few. The programs do not require pre-registration and are free to very, very low cost donation. Classes in the Humanities, Arts, History, and more are taught by engaged and skilled teachers and require pre-registration. Through a very successful partnership with Front Range Community College, this award winning peer to peer teaching model program offers 30 classes and numerous one on one assistance sessions each quarter and offers a regular Friday drop in lab. A variety of exercise programs (up to 15 different types of class each quarter) are offered. Use the Friends sponsored scholarship to get involved. Beginning in September of 2015 several “Silver Sneakers” classes will be offered. These activities change each quarter and include film series, concerts, lectures, celebrations and more. Some are free and others have a small fee. Softball, golf, volleyball, pickleball, tennis and others are offered for group and individual play. Some are offered on a drop in basis and others require pre-registration. Explore local and regional areas by hiking, skiing, and snowshoeing. Pre-registration is required. A great way to get to out and about from a simple lunch out in a nearby town to a featured show at the Temple Buell Theatre. Education, history, dinner theaters, concerts, gambling, Stock Show, horse racing, and many more opportunities provide destinations that are fun, engaging, easy to get to (let us do the ticketing and driving). Through partnerships with local travel experts check out the very successful extended travel program. Destinations may include Ireland, Panama Canal, Germany, Baltic Sea cruise and many more. The Friends of the Longmont Senior Center, Inc., have set aside funds to assist seniors in participating in various activities organized by Senior Services. As long as funds are available, an individual may use up to $150 a year towards Senior Services activities of his or her choice and up to $150 per calendar year, specifically to assist low income older persons in participating in Senior Center exercise/wellness programs. Exercise/wellness activities may include: Aerobic Fitness, Feldenkrais©, Line Dance, Pilates, Senior Conditioning, Strength Training, Wu Tai Chi, Tai Chi, and Yoga. Cancellations are not refunded back to the person’s scholarship account. Persons with a total annual income (from all sources) of $20,000 or less for a single person and $30,000 or less for a couple can qualify for scholarships. Call the front office at 303-651-8411 to apply. Sponsored by the Friends of the Longmont Senior Center, there will be engaging speakers this quarter. The programs will be educational, insightful, and intriguing. We hope you enjoy the variety. 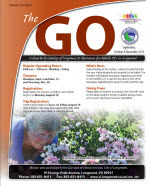 Your guide to the complete listings of activites and programs for older adults in the Longmont community.